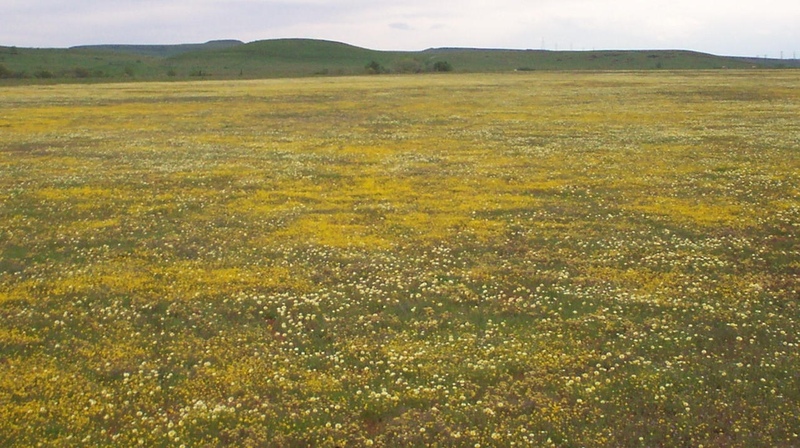 This is the winter range in Springtime, it is currently a blanket of flowers. We call this field “The Airport” because during World War II, the Government “borrowed” it from us. They covered it in blacktop and made it into a testing ground for bombs and planes. There is still a bull’s-eye in the middle of the field made from rock and occasionally we find parts of old bombs. There is a group of Veterans we let fly model planes on it, since it still has blacktop. It’s pretty cool. How Do You Know if a Cow is Pregnant? It does not hurt the cow. It does not hurt the unborn calf. Dr. Walstrum is very good at what he does and it just takes seconds. Picture courtesy of Heather Kingdon. This is great! Want to see what it looks like inside a real beef processing facility? This is from Cargill. We’ve sold our beef to them before. Notice how CLEAN everything is. Notice all the technology. Notice they are SHOWING you what is going on. I LOVE to see this kind of transparency in my industry! THIS IS WHERE YOUR FOOD COMES FROM. SO-CALLED “environmentally responsible” food purchases need to be based on sound science rather than merely perception as work out of Washington State University has shown that those foods consumers tend to think are “intuitively correct” may indeed be the least environmentally friendly option. Dr. Jude Capper, assistant professor of dairy sciences at Washington State University, believes the food industry should use a whole-system approach and assess environmental impact per gallon of milk, pound of beef or dozen eggs, not per farm or per acre. She calls it a “lifecycle assessment” approach, which evaluates all inputs and outputs within the food production system and allows for correct comparisons of different production systems. Intuitively, today’s modern production practices often seem to have a higher environmental impact than the “idyllic” management practices of the 1940s, said Capper. Nonetheless, when assessed on a whole-system basis, she said greenhouse gas emissions per gallon of milk produced are now 63% lower. In 2007, the U.S. dairy industry produced 8.3 billion more gallons of milk than in 1944, but due to improved productivity, the carbon footprint of the entire dairy farm industry dropped 41% during the same time period. Pasture- or grass-fed beef also is growing in popularity due to the perception that it is more eco-friendly than conventionally produced beef. However, according to Capper, the time needed to grow a grass-fed animal to slaughter weight is nearly double that of animals fed corn. This means energy use and greenhouse gas emissions per pound of beef are increased three-fold in grass-fed beef cattle (Figure). In total, finishing 9.8 million cattle on pasture instead of in a feedlot would require an extra 60 million acres of land. Again, Capper said, the intuitively environmentally friendly option has a far higher resource and environmental cost. Capper said in comparing pasture- or grass-fed beef to conventionally produced beef, all growth-promoting technology was excluded. A corn-fed example included no growth hormones or implants at all, she said. Capper is working to access the influence of those technologies in beef production from an environmental standpoint and hopes to have the results within the next six months. In Europe, where growth-promoting technology has been removed from beef production, a 10% drop in efficiency has been documented. Capper’s calculation will have to take into account the energy expended to manufacture the implants and growth hormones. Another emerging trend among American consumers is the desire to purchase food grown locally. “Often, ‘locally grown’ food is thought to have a lower environmental impact than food transported over long distances due to carbon emissions from fuel,” explained Capper. The phrase “food miles” has become a popular buzzword, defined simply as the distance food travels from its place of origin to its place of final consumption. For example, buying 1 doz. eggs that were transported several-hundred miles to a grocery store in a tractor-trailer that can carry 23,400 doz. eggs is a more fuel-efficient, eco-friendly option than purchasing 1 doz. eggs at a farmers market, as that uses 4.5 times more fuel, or at a local farm, as that uses 17.2 times more fuel. In the comparison, total mileage came to about 807 miles for the grocery store eggs, 93.2 miles for the farmers market example and 27.34 miles in the local farm example. The tractor-trailer transported 23,400 doz. eggs, the farmers market calculation was based on 1,074 eggs in a pickup truck and the local farm calculation was based on a consumer picking up one container of a dozen eggs in a single trip. “The high-capacity vehicles used in modern transportation systems improve productivity, allowing food moved over long distances to be highly fuel efficient and environmentally friendly compared to locally grown food,” Capper explained. She noted that the study found that the greatest fuel usage resulted from the consumer’s car. The desire to protect the environment and to do so, in part, by altering personal behaviors is admirable, said Capper. However, she emphasized that those personal decisions must be based on logic rather than intuition. “Consumers might think they are making the responsible, virtuous food choices when, in truth, they are supporting production practices that consume more natural resources, cause greater pollution and create a larger carbon footprint than more-efficient, technology-driven, conventional methods,” she concluded. Co-authors on this work included Dr. Roger Cady, senior technical consultant at Elanco, and Dr. Dale Bauman, Liberty Hyde Bailey Professor at Cornell University.